For all the benefits of free music, something celebrated here on Disquiet.com almost daily, it’s hard not to read some free offerings as a reflection on relative cultural status. The Grammy Awards, in its not uncontroversial recent revamp, finally added a video-game-score category, while doing away with numerous other genre-specific awards (the latter move having many calling foul). Yet it’s not like these scores are doing particularly big business — at least not as recorded standalone fixed artifacts. As part of the ensemble creativity that goes into video games, they are an essential and largely overlooked component of interactive media. But when a property like Bioshock puts its full score online for free, as it did back in 2007, and as now Portal 2 has also done, it’s hard not to sense that the companies doing so know that the artifacts are just that, shards of experience. A formal game score release is as much a parody of a movie score as it is a parallel. Music in video games by and large doesn’t progress the way it does in a film — it shifts according to how the game play proceeds, and that is based almost entirely on decisions made by the player. Thus, the game score lacks not just the visuals, but the sense of user-directed flow, the manner in which play directs causality. 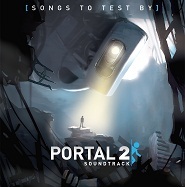 To listen to the Portal 2 score if you’ve played the game is, among other things, to laugh, to know the jokes that the cues coincide with, but also to know more broadly how the theatrical bombast and surveillance chic collide into an unlikely and singular form of entertainment. There’s much to enjoy in the Portal 2 score collection, titled Music to Test By, even if you haven’t played the game, but it is even further removed from the experience of the game than is a movie score. If the score to Star Wars is once removed from the experience of the theatergoer, the score to Halo is twice removed from the experience of the gamer. Music fans have not yet fully recognized the appeal of video-game music, but even video-game music fans have yet to fully comprehend what that music means when separated from the games it was intended to accompany. The score is available, along with a handful of Android- and iPhone-ready ringtones, for free download at the official Portal 2 site, thinkwithportals.com. That is most fascinating but only, to me, as an artifact itself. I’ll try to explain briefly. As always, your position in a kind of technological frontier, an avante garde space where digitization and music attempt to fuse into a thing that might have a soul (a term used with trepidation, but I think it is what I mean), brings out very interesting human dilemmas. I am not really able to comment on the experiences you describe with games as I am not a gamer. Of course, I am of the Lucas/Spielberg generation (I think that’s likely the best social label for so many of us) and I can recreate certain movies in my mind as I listen to the score. So, I understand your point about game scores–the game’s music is cued to game action with is variable with the player’s action–each player, each actual game play, will create a new score. However, to me this is nothing but the endless variations of capital production and giving it “art” or “creative” status is a veneer for it’s truth. Music, in my understanding, at least in the not so distant past (though, again, like Star Wars, I see my own life passing as if scrolling through a story that starts “A long time ago, in a galaxy far far away”), is an emotional, physical, intellectual creation of mind (as a sensory organ) as it attunes to the vibrations of the audible mysterium. Music is Orpheus; it is vital and physical. It is life. What is this that we’re talking about? What are these impoverished experiences? Distance isn’t necessarily impoverishment. Sometimes it is perspective. When was this not so distant past when music didn’t have a commercial aspect — if that’s what you’re getting at? I’m not sure I was trying to speak to a “golden age” of “non-commercial” relationships (though I’m sure we could identify more than a few, right? ); rather I think that I was, and usually am when trying to comment here or “talk” to you, trying to point out that I think there is a distinction that we might now make between music and sound or at least sound as a “component” part of a thing wherein the “sound” is not primary, even if perhaps still integral. The more technical, or rather, the more subservient to technology then the more I would not call it “music” and perhaps this is one of the point you might have made in calling attention to the marketing of this “part” from a video game. I’m not sure I can think of non-commercial ages of music, myself — unless one gives the church a pass just like it doesn’t have to pay taxes. The technological distinction is where we end up disagreeing. This is, as much as anything, a site about technologically mediated sound. You’re conversing with a guy who listens to refrigerators hum, and who chose to live in his neighborhood in part because moving would mean not being privy to the foghorns, and who spends a lot of time thinking about how mobile-phone apps help break the illusion of fixed-ness cast by commercial music recordings. Where you see subservience to technology, I see perhaps subversion of technology? I’ve been playing with a new phrase to run below the logo on Disquiet.com, and what I’m considering is “Listening to art. Playing with music. Sounding out technology.” That’s where my head is at. And my ears. I’m well aware of your position and thinking…that’s primarily why I find thinking in your space illuminating. But I cannot help but feel that technology does nothing but further remove the human being from the world around us–always mediating. I hear you. Gun fandom aside, I tend to think of technology as neutral. Humans create it, and humans decide what to do with it, some for better, some for worse. I look at a piano and I see a complicated machine, same with a tuba. Did electrifying instruments, as the Dylan cultists believed, cause the downfall? Did the production of instruments with electricity before that? Was it when we stopped singing and started blowing on woodwinds? It’s a rabbit hole down there. Ah, well, I guess we’ll stand apart here as well; your very characterization of technology as a created thing mitigates any imagined neutrality. I might call a rock neutral and it still is even if picked up an hurled at another being. Technology–coming out of the confluence of mind and nature, a product of the shaping mind (book plug for “A Voyage to Arcturus”)–has nothing neutral about it. Now, I’m not quite giving it “agency” but what I am saying is that technology, created by mind, instills the impetus to new creation and “new mind” as it is a mind “of technology”. So that new tech, coming out of that old tech, keeps pushing on into “tech mind” in ever-changing guises.